Whether you are an employee suffering from a hostile work environment, discrimination or a wrongful termination, our attorneys can help you seek justice. If you have a dispute over wages, our law firm will fight for your right to fair compensation. If you feel you need to report unsafe or unethical practices, we will ensure the protection of your rights under the law. If you are a business owner or company leader who faces a legal issue related to the theft of intellectual property or an employment dispute, we can help you address those issues and protect your business. Employers who are facing other forms of employment litigation can also turn to us for help in ensuring their companies have all necessary legal protections in place. 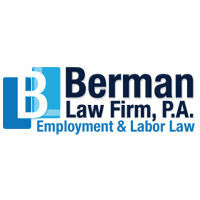 At Berman Law Firm, P.A., our attorneys understand that each client's case is unique. Building a successful legal strategy depends on the special circumstances surrounding the issue at hand, and our attorneys have the experience and resources to achieve the results our clients expect and deserve.